I am delighted to announce that I was elected President of the British Chamber of Commerce in Belgium on the 27th of May. It is a great privilege and honour for me to lead such a thriving organisation and I would like to thank you all for electing a Council that has put their trust into me. I moved to Brussels about 15 years ago after working in Paris, Washington DC and Tokyo. In the capital of Europe, I found the perfect environment for my professional life and have remained here ever since. French of Hungarian and Italian descent, I consider myself a true European and firmly believe in the importance of a strong UK relationship with Belgium and with continental Europe. I have been involved with the British Chamber of Commerce for five years. A Council Member for three years, I have been offering my advice, expertise and time on a number of projects, including chairing the Ambassador’s Gala Steering Committee, CSR projects, brand development and recruitment of new members. As the new President, I will continue providing service and network of political, business and media influencers across Europe to the Chamber and its members. 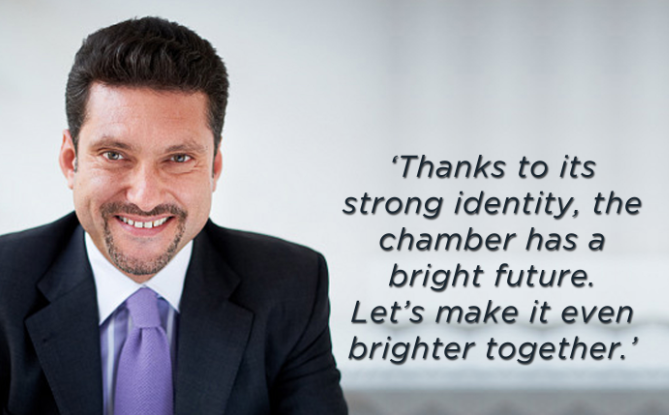 Together, we can ensure that the future of the chamber is even brighter. The Chamber has matured phenomenally in recent years. It has become more structured, more professional, and more ambitious. But many challenges lie ahead requiring us to remain relevant and continue to offer opportunities in a volatile economic and political environment. Globalisation – We need to keep enlarging our membership and become a relevant voice beyond the UK and Belgium. UK referendum – The Chamber should build on its reputation as an open and informal environment for businesses and become an essential voice in the debate around this momentous event. EU’s future – Growing nationalist tendencies, scepticism towards the single market and apathy towards the future of the EU project are all potential risk factors for an organisation devoted to trade, business and prosperity in Europe. Increase visibility: We must further raise the Chamber’s profile in Brussels and abroad, involving players with whom we have had little contact in the past, such as MEPs and official representatives from Eastern European and neighbouring countries, as well as NGOs. Expand the membership base: While maintaining and expanding our core Belgian and British base, we should work to expand our membership in Eastern Europe, the Baltic and Nordic EU Member States and businesses from outside the EU. Enhance our offering: Networking, trainings, policy briefings and similar events constitute the bread and butter of the Chamber, and we must develop this offering even further while keeping the Chamber agile and non-bureaucratic. Diversity: The Chamber should strive to adapt to our increasingly diverse world, as regards gender, nationality and age. I intend to boost our female membership and empower the Brussels New Generation Group with new trainings and skills development opportunities.